Designed to work with Canon EF mount DSLRs and compatible detachable lens video cameras, the Canon Compact Cine Servo Lens takes advantage of the huge range of Canon EF mount functions, including 3 modes of image stabilisation and super-fast autofocusing. Powerful Dual Pixel CMOS AF means you can quickly and accurately focus with a single push of a button, while continuous AF lets you track your subject without losing focus. Peripheral illumination correction helps maintain an even illumination across the entire frame, while the lens and camera will remain in constant communication, from lens metadata acquisition for easier post-processing to even allowing you to select a ‘T’ number or ‘F’ number on your camera’s display. 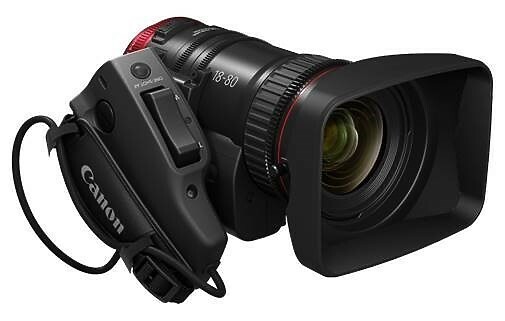 Hire the Canon CN-E18-80 T4.4 w/ ZSG-C10 Remote Zoom Grip from Procam. Best service and rental rates for the Canon CN-E18-80 T4.4 w/ ZSG-C10 Remote Zoom Grip and all cameras, lenses, sound, lighting and grip.